For my son’s birthday, we bought him a pet mouse. Not long after, my daughter talked us into getting her one too. After all, “they get lonely by themselves, Mom.” And I have to admit, the mice are cute (minus the fact that we need to clean their cage every other day to keep it from smelling). 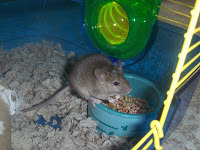 A few days ago, the mice were rolling around in their plastic balls in our kitchen “getting their exercise”. It’s actually fun to watch them running as fast as they can, moving from one end of the room to the other. And all was going well, until I walked out of the pantry and didn’t see Spot right under my feet. I sent her rolling–high speed–clear to the other end of the kitchen. She became a gray blur as she spun around and around. I ran after her, scared (and sure) that she might be hurt. But when her ball hit the cabinets on the other side of the room and stopped, that little mouse stood there for a total of three seconds (if that), shook herself off, and started running again. She didn’t miss a beat. And I realized, life can be like that sometimes. Sometimes, we get a kick that sends us spinning. We’ve all experienced it to some degree or another. Sometimes it’s a small kick that simply gets our attention–a disappointment, an inconvenience, a minor sickness. But sometimes we get hit so hard that we’re tossed upside down and backwards, and we wonder if we’ll ever stop spinning. Like when my friend and my mother-in-law were diagnosed with breast cancer. And when a family at our church lost their youngest son. 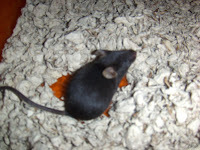 Most of the time, our pet mice live a great life–up and down tunnels, making nests and eating nuts. What more could they ask for? But that kick in the kitchen sent Spot for an unexpected ride. One that I’m sure if she had a choice, she wouldn’t have wanted to take. And even though I still feel bad about kicking her ball, I’m thankful for the reminder that, no matter what life brings, we have to keep going. We have to shake ourselves off and start running again. We have to keep rolling and never, ever give up. « Is the Grass Really Greener? Great story and how true! We did the gerbil thing with our kids, and it did get really nasty. We ended up giving them (the gerbils :) away and getting the dog I said I would never get!